Enter Doctor Mortimer's mansion and fight the horrors that await within. Hordes of the undead, raging fires, rabid creatures and a diabolic security system stand between you and the antidote, which might be humanity's last hope. You will have to team up and fight for every step just to stay alive. To reach the doctor's laboratory you'll have to race the clock. Do you dare delve into the darkness? Dark Darker Darkest is a cooperative survival-horror game. 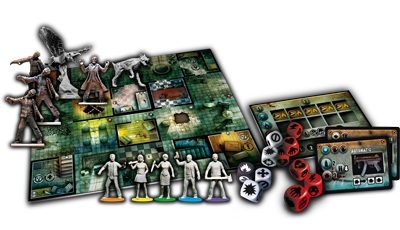 A team of 2 to 5 survivors must explore the heavily guarded house of Dr. Mortimer, find and unlock his laboratory in time, and get hold of the antidote. This is the only way to stop the zombie apocalypse. To override the security system, the team must search the house for equipment and use it to unlock doors. The codes collected from the doors will allow the team to eventually unlock the lab only to find that the raging hordes of zombies, rabid creatures and out of control fires that have been encountered so far are about to be joined by a nemesis who must be destroyed in a dramatic final showdown. Each round is played over two phases. In the upkeep phase, new zombies enter play, fire possibly breaks out or spreads, and darkness (i.e. the game clock) may advance. In the action phase that follows, each group of heroes who share a room form a temporary team. In turn, each team performs all of its actions (in whatever order they like), and each team's turn is followed by nearby zombies and creatures closing in, as well as fire spreading. The round ends when all teams have completed their turns. Can you fight the darkness? The modular build-up of the house and the high variability of the zombie spawns, fire spreading or just the placement of the code chips guarantee high replay value and most of all that no game will play the same. Add a Review for "Dark Darker Darkest"